What's wrong with England cricket ? I am amazed how the bloggers on the blogosphere, including some that should know better, think that England's problem is one of selection. They roll out their tired old diatribes about the inadequacies of one player or another and then honour us with their XI, as if they have some extraordinary insights denied to mere mortals (like the Selectors, for example). The twenty or so cricketers in the frame for England at the moment are all decent cricketers and you should be able to perm any eleven from the twenty and get a side that will win you matches - even against the toughest opposition. So why don't we win? The answer is to do with leadership and motivation, pride and cojones (or the lack of them). Under Duncan Fletcher and Michael Vaughan twelve players (all of whom, bar Trescothick, are still in the frame by the way) fought like tigers and played, at times, like Kings. They built a relationship with the spectators in the packed grounds and vicariously via the media with millions around the country. Every over, every session, every day and every match mattered to every single one of them. Each player did what he was best at and every player fought like hell to support his team-mates. When Geraint Jones had a few problems at Trent Bridge an interviewer asked Fred Flintoff whether there were doubts about Jones - "Not in our dressing room there aren't" he said. The focus, the pride, the ambition, the courage, the flair and the style (day one at Edgbaston for example) of England in 2005 was quintessentially Australian! England out-Ozzed the Aussies over those glorious weeks. Roll forward to today and a squad made up of broadly the same (or the same type) of players under the same Captain is nowhere. Outplayed in every department at Headingley and out-battled by a cojones-full Saffer side at Lord's. Was the Second Test eleven that much worse than England 2005? I don't think so. Cook is a different player to Trescothick but no less talented. Monty is a better bowler than Gilo. Ambrose looks to be as good as Jones. Anderson, on his day, is on par with Simon Jones. And so on. Nothing much wrong with the selection of the England sides in the first two Test matches in my opinion - quality players all (I leave out Pattinson whose selection was an aberration which hopefully won't be repeated). So what's wrong? Well lets start with the ECB and their unspeakable head Giles Clarke. Clarke has his eye not on the ball of creating an environment within which England cricket prospers but solely on the main chance of $$$$. The Stanford deal is an obscenity with no cricketing justification whatsoever. I for one don't begrudge the players their chance to get rich. But not like this. Inevitably every England squad player will have at least part of his mind on Antigua, and when a part of your mind is distracted then you are sub-optimally using the rest. Even Michael Vaughan, no Twenty20 star he, started to play a bit of Twenty20 almost as soon as the Stanford deal emerged. I don't blame him for that, but it was a distraction that our Test Captain could have done without. So Clarke, and his sidekick Collier, instead of focusing on a challenging series of international matches that really matter, home and away, spent their time trying to screw as much money out of cricket as possible whilst keeping the counties happy. They would have been better advised to read William Buckland's "Pommies" which brilliantly gets to the truth of what is wrong with English cricket and suggests that we need to be more Australian, not just in style and ambition, but in our domestic structure as well. I agree. I am unimpressed by Peter Moores who seems far too much of a county insider to me. Fletcher had some county experience that he used shrewdly, but he was a winner because he wasn't hidebound to the so-called traditions of English cricket at all. And, glum old bugger that he could sometimes be, he built a partnership with Michael Vaughn and the other senior players in the squad which won The Ashes. Not a bad model! So what to do? Firstly try and get Clarke and Collier to focus on the real job in hand - or get rid of them if they can't. Second get rid of Moores - he looks like a loser and that rubs off on the side - and get a foreign coach of real quality (welcome back Rod Marsh?). Third select a squad of the best twenty cricketers in England with a balance of youth and experience (welcome back Ramps) and every single one of whom can play cricket in any of the three forms of the game. Work with this squad in every which way - boot camps not excluded if that is what the coach thinks will help! Fourth get rid of the selectors. Give your new top coach full control over selection - aided by a small team of experienced talent spotters if you like - but make the coach an Alex Ferguson or an Arsène Wenger. Finally make Michael Vaughan the Ricky Ponting of England - captain of all the England sides in any form of the game and the honoured, trusted and respected leader. For four years in the late 1980s I lived and worked in Hong Kong – it was an exciting time. Hong Kong’s political future had been decided by the signing of the Joint Declaration with China in December 1984 and the Territory would revert to Chinese sovereignty with effect from 1st July 1997. But although that deal had been signed and sealed the future for the around 5 million people of Hong Kong was far from certain. Among the professional and business classes there was an imperative to secure citizenship of a safe haven country such as Australia or Canada, mainly as an insurance policy in case all went belly up after the handover. You could understand the concern – whilst some changes were underway in China it was still a largely closed country with aged autocratic leaders and not even the smallest semblance of an elective democracy. It was also still very economically backward, although change, especially in the cities, was gradually gathering momentum. The fear for the Hong Kong people, many of whom were themselves escapees from Communist China in the years after the revolution of 1949, was the insanities of Mao’s “Cultural revolution” would one day return – and that Hong Kong would not be able to escape the impact as a sovereign part of the People’s Republic. For a couple of years I travelled frequently into China and especially to the Capital Beijing. Progress was underway – smart new hotels were being built and western businesses were scurrying around like bees round a honey pot. The attraction, of course, was China’s principal resource – a potential workforce of over a billion people which was both a massively attractive market in the long term as well as a source of cheap labour for multinational manufactures. Form 1986 to early 1989 I found it stimulating, if at times a little bizarre and frustrating, to be watching the changes underway and to be working with mostly quite young people who were the drivers of this change. Amongst the many things I did at the time was to make a TV documentary with China Television which I fronted in vision – it was shown on prime time TV and had an audience of over 300million – a humbling and sobering thought! Whilst the most visible signs of change were the gradual presence of western brands on display in the cities there was also a very tangible change in expectations amongst the young people that I met and worked with. True their main hope was that they would be able to accrue personal wealth as the moribund and arthritic pillars of the centrally planned “Marxist” economy began to be dismantled. Suddenly it was OK to aspire to be rich. But whilst the main ambition was to become as wealthy as their contemporaries across the border in Hong Kong, and to be able to create a life of comfort for their families, many of the young people I met also believed fervently that China needed to change politically as well. The two underling necessities were for the gerontocracy to fade away and for democratic processes gradually to be introduced. There was admiration of the West not just for our riches but also for our freedoms. Indeed the two aspects of a modern society – a social democratic system which was essentially capitalist at its core was seen only to be possible if there was a representative democratic system in existence in parallel. Capitalism was the most successful economic system yet developed by mankind – but absolute laisser-faire was not desirable. There had to be checks and balances to prevent exploitation and corruption – and to allow a measure of all joining in and benefiting from the earnings from growth. Freedom of expression was at the heart of the necessary changes that the young people I met were seeking. And looking at the rest of the world it was an almost irrefutable fact that freedom of expression, including freedom of the media, was a necessary condition for economic change. So in early 1989 when I went to Beijing I found a gathering hope on the part of many of the young Chinese I came into contact with for a raft of changes in their country –political as well as economic. Incidentally it is important to stress that the people I me were not students – they were young people, often very well educated, in business and the media. In mid April these aspirations tuned into action when pro democracy protesters started to gather in and around Tiananmen Square in Beijing. The following week I was in the City and visiting the offices of China Television in connection with the film that we were making with them. In the Square that week the numbers reached around 50,000 – an impressive and moving site and amongst them were many of the young people that I had got to know over the previous two years or so.. Back in my hotel I tuned into CNN to see what the rest of the world was saying about what I could see with my own eyes. But every time the CNN presenter said “And now China” the screen went blank and the sound went away – only to return a few minutes later when the China story had finished – censorship in action and the first time that I had experienced it and very chilling it was! At the end of that dramatic week I flew back to Hong Kong – I was never to return to China that year and I have never been back since. 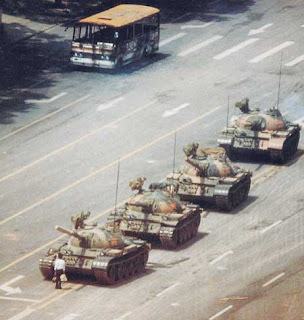 At the end of May Chinese troops began to mass around Tiananmen Square and on June 3rd they moved in. The death toll from the action remains a State secret but probably a thousand or more protesters and some soldiers died on those fateful days. I never knew how many, if any, of the dead or wounded were young people that I had got to know. But what I did know was that something indescribably evil had happened and although my own connection with the events was tenuous I had been in Beijing and in Tiananmen Square at a fateful time, and I would never forget it. Since 1989 we have all witnessed the economic miracle that is modern China and thousands of Chinese and no small number of westerners as well, have become very rich indeed on the back of China’s wholehearted embrace of capitalism. But whilst the pursuit of wealth goes on almost untrammelled and western companies exploit the Chinese market and benefit, as they had hoped, from the low labour costs of Chinese workers, there has been little or no change in the repressive political system that operates in this autocratic dictatorship. Nearly twenty years after Tiananmen China remains a tightly controlled one-party and totalitarian State in all areas of life, except the economic. Human Rights abuses are endemic and, externally, state inspired Chinese imperialism keeps Tibet firmly under their thumb and state-inspired capitalist imperatives lead Chinese companies to operate anywhere that money is to be made irrespective of the Human Rights implications and ignoring sanctions – Sudan just one example of this . Back in 1936 another totalitarian State used an Olympic Games to demonstrate their power and promote their nationalism and their ambition. At the time Avery Brundage, President of the American Olympic Committee was against the boycott, stating that he believed that politics played no role in sports, and they should be considered two different entities during Hitler’s Olympics. 72 years on the same solecisms are being spluttered by Olympians and Politicians alike who expect us to go to Beijing to celebrate a Games in a country, which like Nazi Germany back in 1936, has no respect at all for the values that are supposed to underpin the Olympic movement. One of these values is “Cooperation with public and private organisations to place sport at the service of mankind”. In Beijing, as in Berlin, the IOC is placing sport at the benefit not of mankind but of a evil totalitarian regime some of whom were directly involved in Tiananmen and all of whom cover up to this day what really happened. Count me out.